However, I also believe anything beyond hoping such legislation or significant action might even begin to affect this scourge is naive at best. I own two guns: a 20-gauge, double-barrel shotgun and a .22 calibre rifle, neither of which have left their cases for at least ten years. By definition, this makes me a law-abiding hunter/gun collector. Were I to plan a mass attack, the 20-gauge would be of little use. I might discharge two shots – horrific and tragic enough if I hit someone — before some courageous by-stander knocked me down and disarmed me. However, my .22 is, by strict definition, no different from an “assault” rifle. It has a 10-shot magazine and will fire as fast as I could pull the trigger. If I wanted to, I could purchase – legally – a 20-shot clip or a 50-shot barrel magazine for my .22. But these magazines are notorious for jamming. They’d be a poor choice should I become unhinged and set off on a rampage. However, the biggest difference in my .22 rifle and weapons used for mindless carnage is the ammunition. A .22 slug is about half the size of the tip of my pinkie. Remember. John Hinkley shot President Reagan in the chest with a .22, but missed any large organs or arteries. Reagan left the hospital after a day or two. 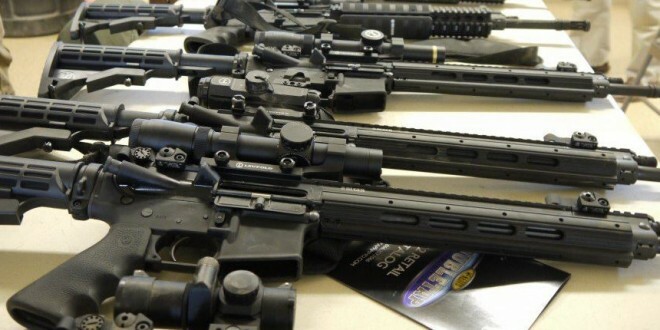 People tend to equate “assault rifles” with the lethal, all-business, weapons used by armed forces that will indeed keep firing as long as the operator suppresses the trigger. The law already bans personal ownership of such a weapon. Also, a very common, 62-grain round fired from any pistol or rifle would certainly have killed the ex-President by pretty much tearing his chest open. However, the cowards in Congress, many of whom are in the NRA’s pocket, recently turned down legislation revoking the rights of a person on the no-fly list to buy guns. These folks are law-abiding gun collectors and hunters? Really? Gun-control legislation, even if the rump Congress were to come back to Washington from vacations, junkets, or campaigning, would at best be a flicker of hope and sanity in a dark world. Only a titanic shift in our national character might make stricter gun laws an effective reality. Given the current tone of rhetoric which masquerades as sane, public discourse in the United States, how likely is such a sea-change to occur? Bob, see if you can follow this. The United States Supreme Court has the role of determining what the law is, including the U.S. Constitution. The Supreme Court has found that the Second Amendment includes a right to private firearms ownership; a right that you are currently exercising. The no-fly list is administered by the Terrorist Screening Center. Do you know what agency that is a part of? Do you know what criteria it uses to place 50,000 or so people on its list? Do you know how to get a name off the list if it is on it by mistake? Did you know that the late Senator Ted Kennedy was denied the right to board planes more than once because someone had a similar name, and only remedied the situation by using his substantial political clout? Do you know whether the actions of the TSC satisfy our right to due process? You suggest anyone who declines to extend the power of the TSC to the arbitrary denial of Constitutional rights is a coward. I respectfully and vehemently disagree. I would like to say for the record that the size of the projectile from a .22 and an AR-15 are very similar, with the AR-15 shooting a .223 round that is only .003 thousands of an inch larger than your .22 rifle. The deadliest gun available today is a 12 gauge shotgun loaded with 00-buckshot. Every time you pull the trigger, 9-16 balls (depending on brand and length of cartridge) shoot out of the barrel, and each of those balls are .330″ in diameter, much larger than a .223 round. We have laws concerning guns, too many if you ask me. What is missing in today’s society is the value of human life. It’s been proven over and over again that violent crimes multiplies with increased gun control, since criminals don’t follow laws. We already have laws banning drugs in our society, how are they working out for us? I always wonder, Mr. Gray, when I read of folks’ desire to “ban assault weapons”, what good do you think that would do, really? The real question regarding a ban on individual ownership of assault weapons is very clearly not the question Jean asks. Who knows what “good” a ban would do, but can anyone answer the question of why a law-abiding citizen needs an assault rifle? And please, please, don’t say that you need it to protect yourself from a lawless person who has one. A totally flawed and mindless argument. It is good to hear that Tony LaBrasca believes that the Supreme Court is the final arbiter of what the law is. Since that is the case, I assume that Mr. LaBrasca and those who agree with him are fully supportive of the Supreme Court’s decision in Roe v Wade and the recent decision holding that marriage between people of the same gender is a Constitutional right? It is good to know that all those who support the 2nd Amendment also support a woman’s right to choose and the right of anyone to marry whoever they want to. The second amendment didn’t simply protect our right to hunt or to protect one’s home, but to form a militia and fight against a tyrannical government. At this point in time I don’t think any American’s arsenal could put up a comparable fight against the lethal/stealth weaponry that our government has developed. But I would definitely say that our potential collective force is stronger than ANY government or terrorist group in existence. Isoroku Yamamoto, Fleet Admiral and Commander-in-Chief of the Imperial Japanese Navy during WWII, has been (possibly wrongly) quoted as saying “You cannot invade the mainland United States. There would be a rifle behind every blade of grass.” Even if this quote isn’t true, it certainly has truth in the sentiment. So my answer to you Carl would be that EVERY law abiding citizen that DESIRES to own such a weapon should be allowed to. It will be that same person who will be protecting you, your family, your land, your country from both foreign and domestic invasions. History has shown that the first step a tyrannical government takes is to dis-arm it’s citizens. Hitler+Castro+Qaddafi+Stalin+Idi Amin+Mao Tse-tung+Pol Pot+Kim Jong-Il= 56 MILLION people killed by their own government in the 20th Century alone! It should also be noted at this time that, according to the FBI, the deadliest weapon in all homicides? A baseball bat! Where’s the ban on all bats? It’s about time that assault bats were restricted! I call for immediate background checks on all little leaguers! On a serious note, I understand gun violence is a serious issue, but I think enforcement of existing laws would be immeasurably better than further infringing on our right, MY RIGHT, to protect ourselves and our families. I’ve witnessed President Obama say he doesn’t worry about his daughters… why? “Because I have a lot of guys with guns around them.” In 2011, Hillary Clinton approved sending military grade guns to Libya to arm the Libyan citizens against their own government while simultaneously working to remove our guns! Crazy right!?! What’s good for the goose is good for the gander! Umm, actually, yes, I did really mean to ask the question I asked, Mr.Stewart, since that is what the issue is all about. While we all compassionate our fellow human beings when we hear of any tragedy, as we should, it is foolish to react only with emotion — as if enacting some simple laws would fix everything and make everything “sane”. Mr. Fedell put forth some good food for thought. Don’t you think?